You’ve already heard the buzz about cloud computing. ‘The cloud’ is everywhere these days. A simple Google search of the term “cloud computing” generates a staggering 220 million results. But do you know what the cloud is or what it does? In case you’re too busy running your business to comb through those 220 million search results, here’s a primer on understanding the cloud: what it is, what it does and – most importantly – how it can help your business. One of the first things to know about the cloud is that it’s not a product. It’s a way of delivering and consuming everything from infrastructure and software to communication solutions. At its most basic level, the cloud is a way to store and access data from anywhere using the Internet. If you can understand email, catching on to the concept of the cloud won’t take long. Email is super convenient because you can use it from anywhere (and any computer) just by logging into your Web mail account wherever there’s Internet access. When you’re not logged into email, your emails are still stored remotely for you, right? The cloud works the same way: it stores your data so you can access it anytime from anywhere. Instead of saving data on your computer or storage device, you can store it with a cloud-based service. Many cloud services also back up your files automatically on massive banks of remote servers. So even if your computer crashes, you leave it on a plane, or your office floods, whatever you put in the cloud is safe because it’s stored off-premises. The cloud has evolved dramatically beyond just storing and accessing data online. It’s also a way to access communication and business solutions over the Internet. Many of the business applications you used to buy in a store as software-in-a-box – including accounting, bookkeeping and invoicing programs – are now available in the cloud (you’ve probably heard it called SaaS, which just stands for software-as-a-service). For example, the Bell App store offers various key business apps via the cloud. And Office 365 from Bell bundles many of Microsoft’s most popular business software and apps (like Word, Excel, Outlook and PowerPoint) into one cloud-based service that’s specifically tailored to business owners. So instead of buying software in a store or downloading a version of it onto your computer, you can find a cloud-based provider of these services online and use their services anywhere on any computer, just by logging into that account from your browser. An added benefit to this approach is that you can easily scale most cloud-based services up or down to suit the needs of your business – and enjoy the cost efficient of only paying for what you use. Also, because the services are cloud-based, they’re updated automatically in real-time so you don’t have to keep buying or downloading the latest version. Cloud services offer you many benefits, including the flexibility to easily scale your cloud services up or down as your business needs evolve, and the convenience of being able to access your data and services from any computer, anywhere there’s Internet service. These benefits – along with the ability to only pay for the services you use – have driven many people away from boxed software towards cloud-based services. 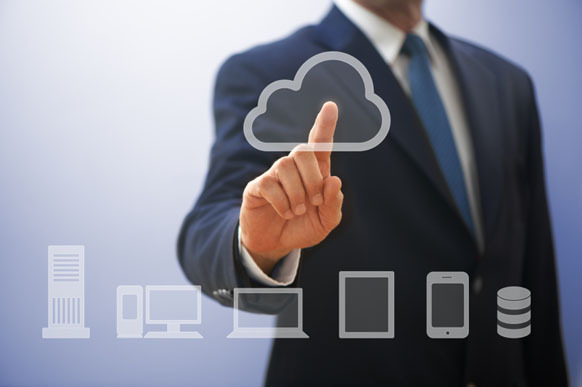 Have you begun utilizing cloud-based services for your business? What advantages, efficiencies or learnings have you discovered as a result? We’d love to hear your thoughts on cloud services, so please share your feedback in the comments section below.